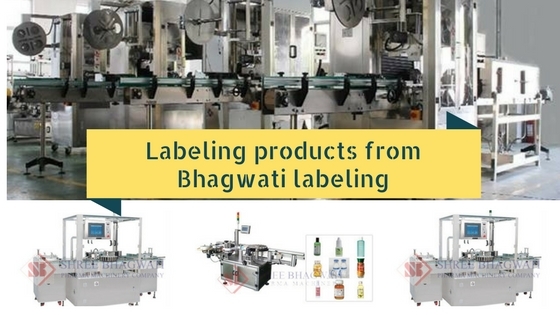 Labeling products from Bhagwati labeling are a full range of machines, most of which can handle various types of containers as well as different types of surfaces. These include the bottle sticker labeling machines, front and back labeling machines, top labeling machines, shrink sleeve applicators, and sealing machines. The equipment is made with very user friendly controls including the programmable logic control systems that enhance the operation of the equipment. The advanced control systems enable easier machine calibration and reduced change over time when switching between different types of labels. The label applicator equipments are designed to achieve good application speeds with great accuracy. The support and framework of the equipment ensures proper stability during operation and have gained widespread acceptance as the equipment of choice. Control system equipped with the latest microprocessors and sensing devices that ensure smooth operation of the equipment. The accuracy of the equipment makes them suitable for delicate vials and small sized bottles and it can achieve a speed of up to 200 vials per minute. The label length detection system is a unique innovation that has helped manufacturers achieves continuous processing without manual feeding. The logic controls system has memory devices that store label information and retrieved when the label is being used. Eliminates wastage due to the “No bottle-No sleeve system of operation. Equipment is able to handle glass as well as plastic containers. The speed of operation can range from 50 – 300 bottles per minute. The shrink sleeve applicator is easily synchronized with tunnel to complete the process efficiently. The company has manufactured excellent designs of the self adhesive labels that are durable and long lasting. The self adhesive labels have been developed through extensive research and innovation to match the exact needs of the different industries. They are also cost effective and allow a good return on investment. The material of manufacture may vary depending on the user preferences and may include semi gloss surface, polyethylene, matt white, polyester and direct thermal labels. Freezer labels are directed for low temperature environments as well as able to withstand high moisture without peeling off. Thermal transfer printers are available for industrial printers with operating temperature range of -150 c up to 900 c and are very ideal for barcode labeling. They are also available in different shapes and sizes. Automatic induction cap sealing machine creates a hermetic seal useful in preventing leaks, preserving freshness and preserving the shelf life of products very effectively. The induction cap sealing machine from bhagwati labeling company is the ideal equipment for rapid sealing operations in an industrial operation. The induction cap sealer is efficient with enhanced sealing capacity that has minimal waste and maintains the aesthetic appeal of package. The calibration and set up of the machine is easy and user friendly thus enabling management of different types and sizes of labels repeatedly. It is also equipped with internal counters and process monitoring that detects errors and faults and stops early enough to prevent further damage from happening.